Desa Cantik, Indonesia – Nurmelis was watching TV on Saturday night in her home on Pulau Sebesi, one of the several small islands dotted around the Sunda Strait, located between the larger Indonesian islands of Java and Sumatra, when the sea began to churn. “I heard a wave crashing on the shore but it sounded louder than usual, so I went outside to take a look,” the 38-year-old housewife told Al Jazeera. Fewer than 20km away from Pulau Sebesi, the latest eruption of Anak Krakatoa – an active volcanic island that has been spewing ash and lava for months – caused an underwater landslide that is widely believed to have set off a powerful tsunami. Minutes after the landslide, the giant waves hit the coastlines of Banten and Lampung provinces, on Java and Sumatra respectively, killing more than 400 people and destroying hundreds of seaside houses, hotels and other local businesses. In Pulau Sebesi, home to an estimated 3,000 people, Nurmelis and her 42-year-old husband Faisal were afraid to return home so they stayed in the mountain without food until Monday, when the Indonesian army and rescue workers arrived with food supplies. 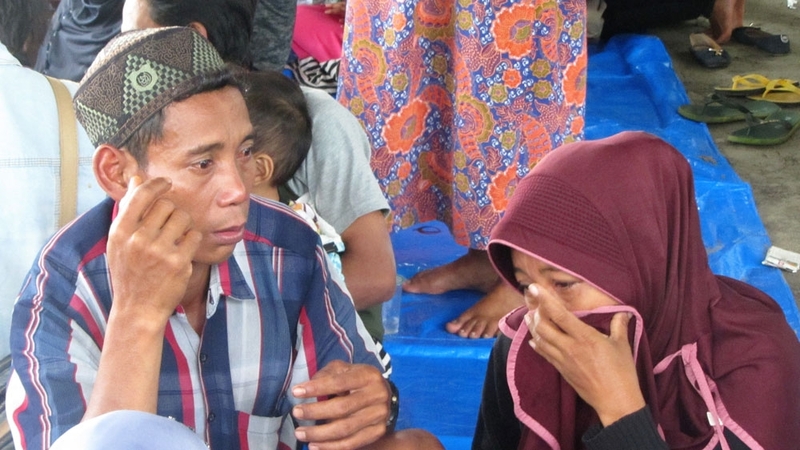 On Tuesday, the couple were allowed briefly to go back home to collect some belongings before the army began the evacuation of local residents to Desa Cantik, a village port in South Lampung. When Nurmelis and Faisal did so, they found that their house was filled with sand and rocks. Asih’s mother, Rohaya, joined them to a mountainous area of the island where the two women made a rudimentary tent using a tarpaulin they found discarded in the jungle. They also didn’t eat anything until Monday when the soldiers gave them rations of instant noodles which they had to cook using water provided from a thermos. 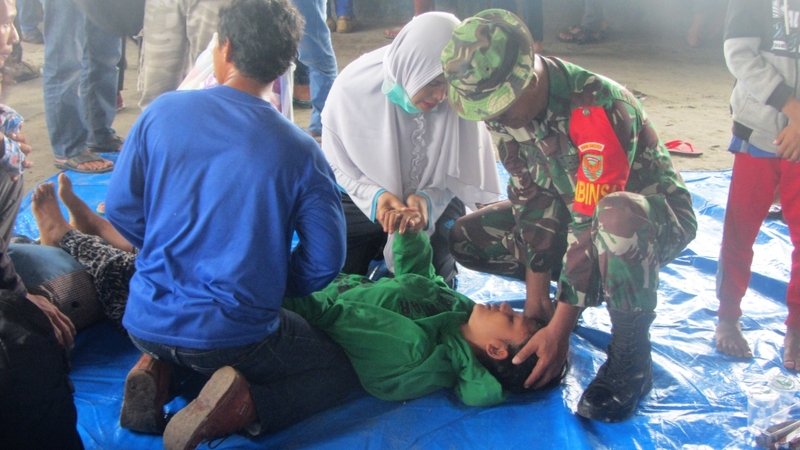 Sargent Tukijan, an officer in the Indonesian army, is helping to coordinate the evacuations from Pulau Sebesi. “We plan to bring over about 400 people and will send five boats to Pulau Sebesi. This is the first,” he told Al Jazeera on Tuesday. With Anak Krakatoa still erupting, there are fears that the volcano could cause another tsunami – something that Rohaya feels is a strong possibility. “I was born on Pulau Sebesi and I’ve never seen the volcano like this. It’s still erupting and the sky is dark,” she said, adding that she believed that this was a bad omen. Patiently waiting on the shore at Desa Cantik was Hidayat, 58, who was hoping his son Hery would be on the evacuation boat. He last spoke to the 34-year-old on Saturday night after the tsunami struck. “I’d actually just come back from Pulau Sebesi as I’d gone to visit him. But he had to work on his chocolate plantation early the next morning so I went home on Saturday afternoon. “When I heard there had been a tsunami I was speechless. Then he called me to say that his home had been hit and everything was gone. That was the last I heard from him,” he told Al Jazeera. “I can’t get through to his phone so I don’t know what happened after that,” he said. Hidayat has been asking evacuees about his son and said there have been possible sightings of him also hiding in the mountains. “I have hope he’s safe and I’ll see him soon,” he said. As of Tuesday afternoon, the death toll stood at 429, with 1,485 people injured and 154 missing, said Sutopo Nugroho, spokesperson for the national disaster mitigation agency. 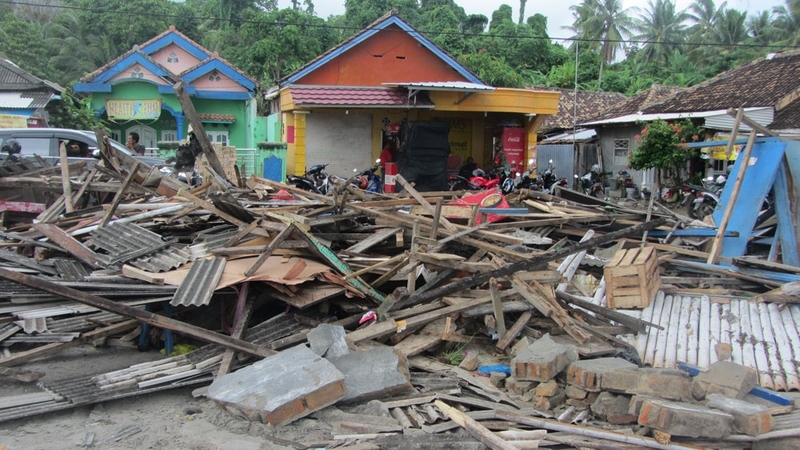 According to the agency, more than 16,000 people are now displaced as a result of the tsunami, including the evacuated residents of Pulau Sebesi. Upon arrival at Desa Cantik, several were so weak from the lack of food that they had to be carried off the rickety wooden rescue boats on stretchers. Some collapsed once they reached the crisis centre. Now all they can do is wait in temporary camps until it’s deemed safe for them to return home. For the moment however, many are just happy to be out of danger – never having felt the fury of Anak Krakatoa in their lifetimes.